Embrace the cold and the snow this winter by visiting one of these amazing eco retreats. Whether you’re into snowshoeing, cross-country skiing, or just sitting by the fire drinking hot cocoa, one of these winter wonderlands is bound to tickle your fancy. These snow-covered hotels allow you to enjoy the magic of a winter landscape while they work to minimize their impact on the environment. Cozy up and check out our favorite eco winter wonderland retreats from all over the world. 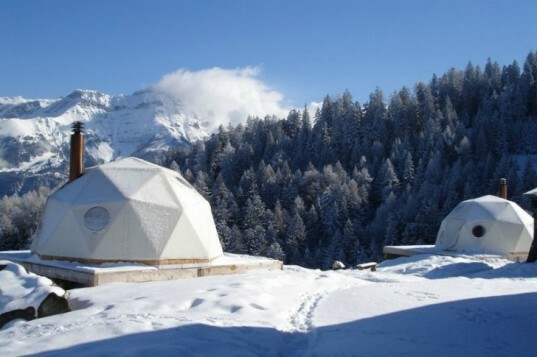 The Whitepod Eco Resort located in the village of Les Cerniers in the Swiss Alps offers a private ski resort, mountain chalets and 15 geodesic-dome pods that offer low-impact accommodations. Guests tour the resort via skis, snowshoes, snowboards and by dog sled. Cozy up inside one of these gorgeous rooms and fall asleep as the snow blankets your pod. Made from snow and ice, the temporary Hotel de Glace is open to the public during the coldest months. 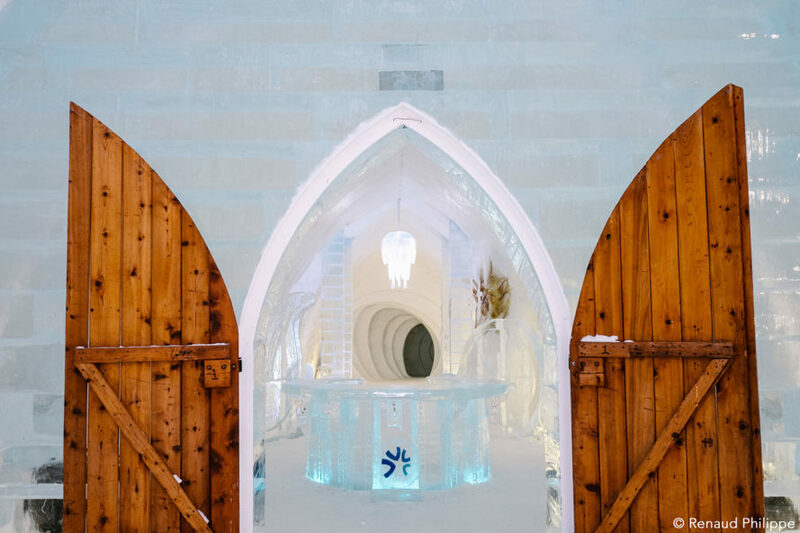 Rent one of their artistically designed rooms, enjoy cocktails at the ice bar or even get married in their beautiful ice chapel. Just be sure to get there before spring, when it all melts away. 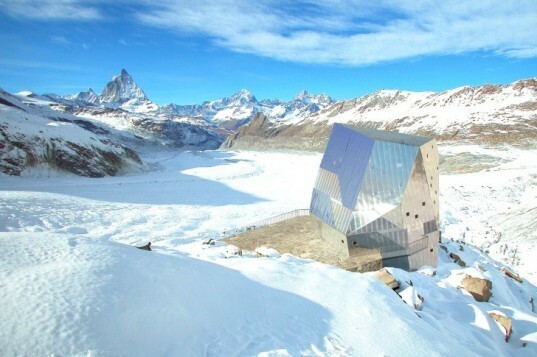 Part of the Swiss Alpine Club’s hut system, the Monte Rosa Hut looks more like an evil villian’s lair than a cozy winter hostel. Powered by solar panels, and making use of energy efficient design, the student-designed hut is almost totally self-sufficient. To get there, you’ll need to ski in and ski out. 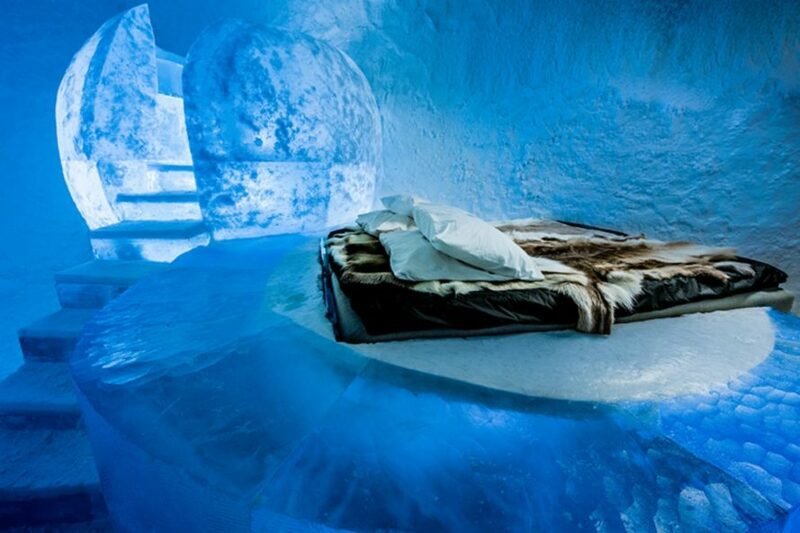 Sweden’s Icehotel is yet another mind-boggling artistic endeavor that only takes place during the coldest months of the year. With a new design each year, it’s like going to a new place every winter. Last year’s design was inspired by Tron and featured energy efficient lighting wire embedded in the ice. We can’t wait to see what they come up with this year. 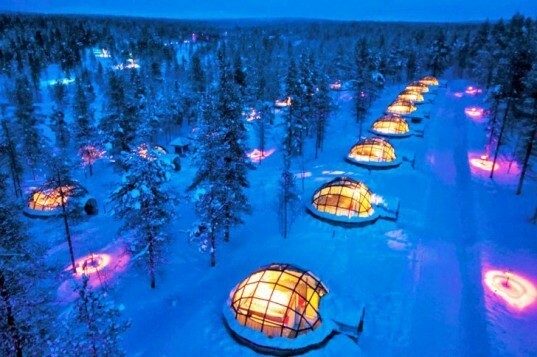 While staying in a glass igloo doesn’t sound super warm, you’ll be plenty toasty at the Igloo Village of Hotel Kakslauttanen in Finland. Their small design allows them be heated efficiently, and the glass ceiling gives a great opportunity to view the Aurora Borealis. A skier’s fantasy – the Mountain Hill Cabin is a private cabin designed so you can ski right down the roof. Created to fit in with the surrounding landscape, the cabin is protected from the weather and lets snow and wind slip right over it. Accessible by skis, this winter retreat will give you plenty of time to play, rest and drink hot cocoa. Although it hasn’t been built yet, Skipark 360 will serve as a man-made ski hill outside of Stockholm. Designed by C.F. 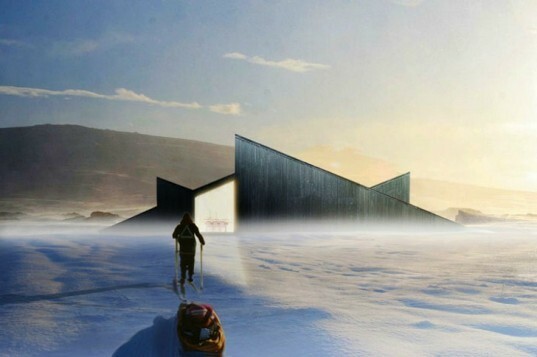 Møller, the entire resort will be powered by geothermal, solar, wind and hydropower, and when it is completed, it could be the greenest ski resort in the world. The amazing Treehotel is open year round and takes advantage of the beautiful Swedish landscape — regardless of whether there’s snow on the ground. Enjoy one of their stunning prefab rooms like the Birdsnest, Mirror Cube or the oddly-named Blue Cone (pictured here). Eco-friendly building strategies are combined with low-impact design and miles and miles of wilderness to play in. How is the Igloo Village of Hotel Kakslauttanen in Finland ecological? Wasting huge amounts of energy through pointlessly large glass roof. Also the skipark 360 can never be considered ecological, since just the construction of that monster will produce tons and tons of CO2. Not everything that's a bit different is ecological, even if it was built in a forest. Interesting article, though! Embrace the cold and the snow this winter by visiting one of these amazing eco retreats. Whether you're into snowshoeing, cross-country skiing, or just sitting by the fire drinking hot cocoa, one of these winter wonderlands is bound to tickle your fancy -- plus they're all eco resorts! These snow-covered hotels allow you to enjoy the magic of a winter landscape while they work to minimize their impact on the environment. Cozy up and check out our favorite eco winter wonderland retreats from all over the world after the break! Made from snow and ice, the temporary Hotel de Glace is open to the public during the coldest months. Rent one of their artistically designed rooms, enjoy cocktails at the ice bar or even get married in their beautiful ice chapel. HOTEL de GLACE, QUEBEC Made from snow and ice, the temporary Hotel de Glace is open to the public during the coldest months. Rent one of their artistically designed rooms, enjoy cocktails at the ice bar or even get married in their beautiful ice chapel. Be sure to get there before spring, when it all melts away. Part of the Swiss Alpine Club's hut system, the Monte Rosa Hut looks more like an evil villian's lair than a cozy winter hostel. Powered by solar panels and making use of energy efficient design, the student-designed hut is almost totally self-sufficient. To get there, you'll need to ski in and ski out. Sweden's Icehotel is yet another mind-boggling artistic endeavor that only takes place during the coldest months of the year. With a new design each year, it's like going to a new place every winter. Sweden's Icehotel is yet another mind-boggling artistic endeavor that only takes place during the coldest months of the year. With a new design each year, it's like going to a new place every winter. Last year's design was inspired by Tron and featured energy efficient lighting wire embedded in the ice. We can't wait to see what they come up with this year. Last year's design was inspired by Tron and featured energy efficient lighting wire embedded in the ice. We can't wait to see what they come up with this year. While staying in a glass igloo doesn't sound super warm, you'll be plenty toasty at the Igloo Village of Hotel Kakslauttanen in Finland. Their small design allows them be heated efficiently, and the glass ceiling gives a great opportunity to view the Aurora Borealis. SKIPARK 360, NORWAY Although it hasn't been built yet, Skipark 360 will serve as a man-made ski hill outside of Stockholm. Designed by C.F. Møller, the entire resort will be powered by geothermal, solar, wind and hydropower, and when it is completed, it could be the greenest ski resort in the world. 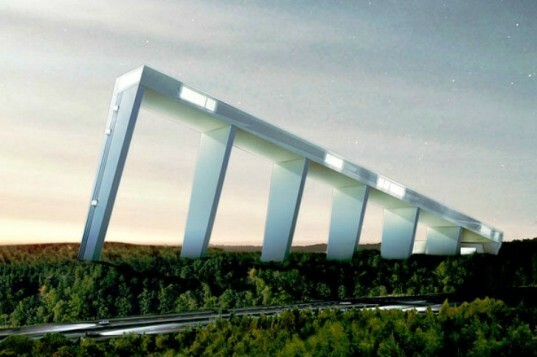 Although it hasn't been built yet, Skipark 360 will serve as a man-made ski hill outside of Stockholm. Designed by C.F. Møller, the entire resort will be powered by geothermal, solar, wind and hydropower, and when it is completed, it could be the greenest ski resort in the world. MOUNTAIN HILL CABIN, NORWAY A skier's fantasy - the Mountain Hill Cabin is a private cabin designed so you can ski right down the roof. Created to fit in with the surrounding landscape, the cabin is protected from the weather and lets snow and wind slip right over it. Accessible by skis, this winter retreat will give you plenty of time to play, rest and drink hot cocoa. A skier's fantasy - the Mountain Hill Cabin is a private cabin designed so you can ski right down the roof. Created to fit in with the surrounding landscape, the cabin is protected from the weather and lets snow and wind slip right over it. Accessible by skis, this winter retreat will give you plenty of time to play, rest and drink hot cocoa. 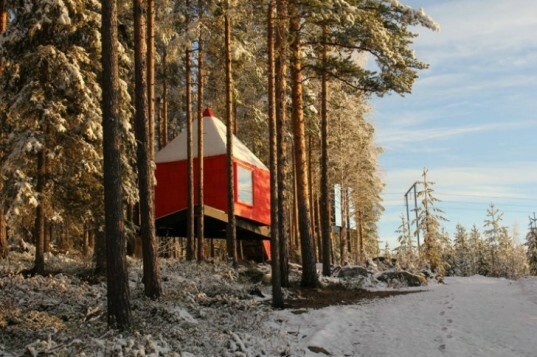 The amazing Treehotel is open year round and takes advantage of the beautiful Swedish landscape -- regardless of whether there's snow on the ground. Enjoy one of their stunning prefab rooms like the Birdsnest, Mirror Cube or the oddly-named Blue Cone (pictured here). Eco-friendly building strategies are combined with low-impact design and miles and miles of wilderness to play in. Embrace the cold and the snow this winter by visiting one of these amazing eco retreats. Whether you're into snowshoeing, cross-country skiing, or just sitting by the fire drinking hot cocoa, one of these winter wonderlands is bound to tickle your fancy. These snow-covered hotels allow you to enjoy the magic of a winter landscape while they work to minimize their impact on the environment. Cozy up and check out our favorite eco winter wonderland retreats from all over the world.